An article published in the journal “Nature” describes the observation of an intergalactic deluge of gases that from large clouds are falling toward the supermassive black hole at the center of a galaxy in the Abell 2597 cluster. By using the ALMA radio telescope a team of astronomers led by Grant Tremblay of Yale University discovered the first evidence that these huge black holes can gorge on gas through chaotic and clumpy rains of giant clouds of very cold molecular gas. The Abell 2597 cluster is made up of about 50 galaxies and is brighter than normal. At its core there’s a massive elliptical galaxy that not accidentally is simply described as the Abell 2597 brightest cluster galaxy. In the space among the galaxies there are huge clouds of gas that usually is hot and ionized but it can quickly cool. In that case, it may condense and precipitate in a manner similar to rain with the difference that the gas falls on the galaxy into its core. At the center of that galaxy there’s a supermassive black hole with a mass estimated at around 300 million solar masses. Three massive lumps of cold gas are falling towards it at a speed of about one million kilometers per hour. Those are massive clouds, with a diameter of about ten light years and a mass around a million solar masses for each cloud. These are objects on such a scale that it’s normally difficult to distinguish them from a distance of one billion light years, even observing them with an instrument such as ALMA (Atacama Large Millimeter/submillimeter Array). This extraordinary radio telescope inaugurated in March 2013 is allowing astronomers to make observations at unprecedented resolution but it too has its limitations. This research was aided by the fact that those clouds cast a kind of shadow as they fall toward the supermassive black hole. In fact, they block at millimeter wavelengths part of the bright background which is emitted by electrons as spiraling along magnetic field lines in the black hole’s vicinity. Other information were collected using another radio telescope, the American National Science Foundation’s VLBA (Very Long Baseline Array). 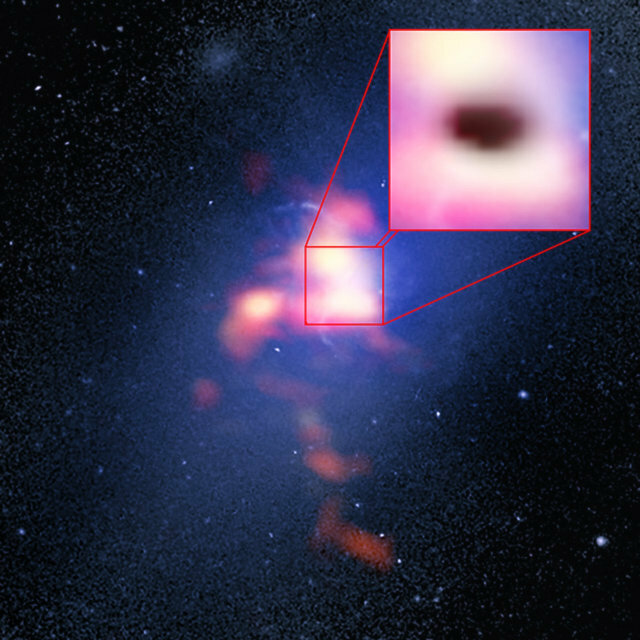 They indicate that the gas clouds observed with ALMA are just 300 light years from the supermassive black hole so they could be devoured at any time. The next step is to use ALMA to search for other phenomena of that type to see if they are common. According to current theory this type of galactic deluge might be common but more data need to be collected to see if it’s correct.